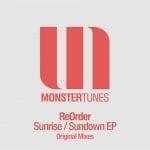 After the great success of his debut release 'Citybeats' on Monster Tunes, which featured on John Askew's 'Skylab' and Sean Tyas' 'Tytanium Alpha' mix compilations, it was no surprise when ReOrder delivered us another superb release, this time with the sublime two track 'Sunrise' & 'Sundown' EP. ReOrder is a new breed of trance producer that has come of age in the last year or two with successful releases on Bonzai Music and Baroque Records, gaining support from across the board with DJs such as Armin van Buuren, Paul van Dyk, Above & Beyond, Ferry Corsten amongst many others. 'Sunrise' is already a massive production to watch out for, with early plays by Above & Beyond before we subsequently signed this beautifully crafted gem, followed up by a more driving euphoric number that features the epic vocals of Irena Love. A massive EP to listen out for over the next few months!